We have enough. We are enough. Life is good. And for that we are grateful. In 2007 I fell from a third story balcony and shattered both of my ankles and broke my back. But eventually I sat up in bed, eventually I was strong enough to roll myself in a wheelchair, and eventually I stood on my own two feet again. The doctors told me that the fatality rate from falls from that height is 50%. My spine broke “this way” and if it would have broke “that way” I would have been paralyzed or worse. The day they told me I’d walk again “in about 8 months,” I was forever changed. My perception of my situation was one of complete gratitude. And to this day, that is still how I feel. 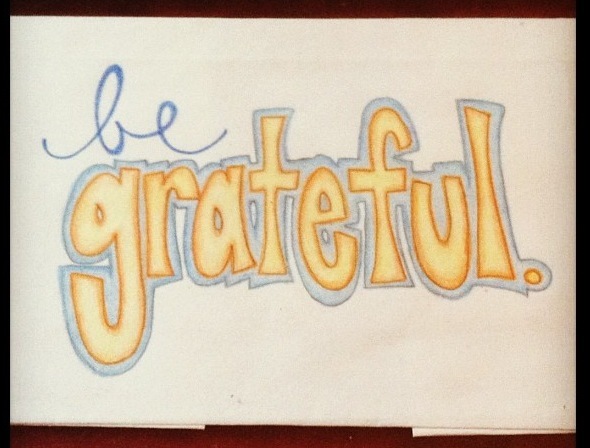 For Christmas that year, I drew a picture of the words “Be Grateful” and made small laminated cards for everyone who had any part in my experience. 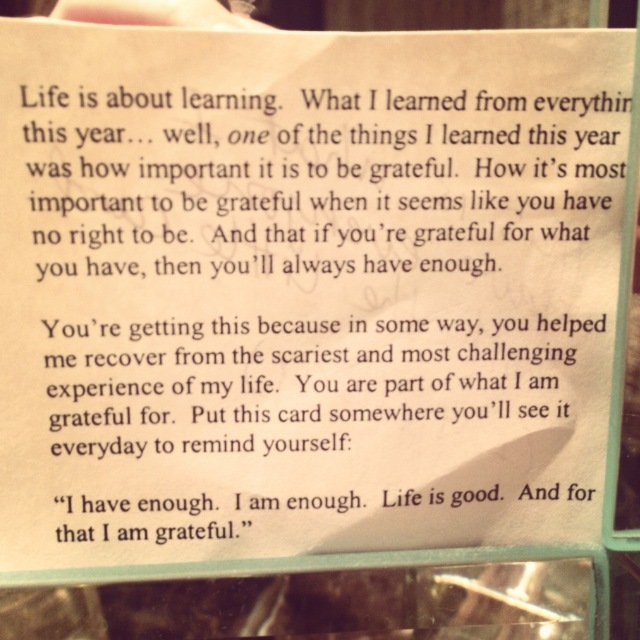 My family all got a 3×5 “Be grateful” in a frame. And everyone from my friends and my boss, to my dad’s mailman, to the neighbor who brought me food and DVDs, to the surgeons, doctors, nurses, receptionists, EVERYONE I crossed paths with during that experience got a “Be Grateful” card with a typed explanation of what those words meant to me. Since then, it’s evolved. I passed out all the cards I made that first year and then I made more. Christmas 2012 I made a new version of the card and people kept mistaking them for stickers, so then I started making stickers. The stickers evolved into a stencil, and the whole thing started popping up on Instagram. Now I’m sending out stacks of stickers to strangers all over the country. And they’re taking the stickers all over the world. This concept was born in my heart as a result of near tragedy, and my role in the movement is simply to facilitate it. The directions it’s taken have been dictated by the people who embrace it. Where it’s going? What’s next? I guess that’s up to us!